The Tory Trauma Program at Sunnybrook provides seamless clinical care, innovative education and a top-tier research platform for studying acutely ill and injured patients. The Tory Trauma Program builds upon a legacy of innovation and excellence. In 2008, the Board of Sunnybrook identified trauma as one of five strategic priorities, thereby recognizing the hospital’s international renown in this area and dedicating resources to its growth. 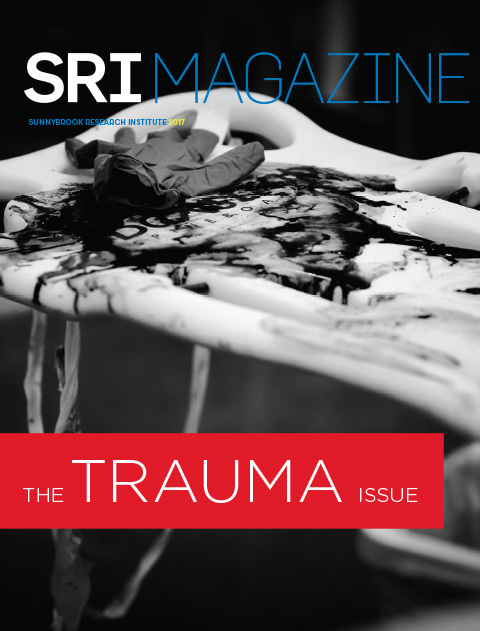 The Tory Trauma Research Program at Sunnybrook Research Institute (SRI) is a multidisciplinary and multidepartmental collaboration made up of specialists from critical care medicine, nursing, orthopaedic surgery, neurosurgery, general surgery, plastic surgery, pharmacy, anesthesia and epidemiology. evaluating burn wounds and graft evaluation. The focus of the Tory Trauma Research Program balances scientific rigour with everyday practicality. Our overarching aims are to improve survival and quality of life, and to deliver high-quality, evidence-based care. We engage clinicians and researchers at all levels to develop innovative approaches to care for the critically ill. Our research teams also collaborate with national and international experts to accelerate the translation of new discoveries and therapies into the clinic.